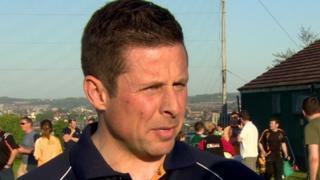 Antrim joint-manager Gearoid Adams says he misses Casement Park and hopes the county's dilapidated stadium will soon be redeveloped. The saffrons are unable to host home Ulster SFC championship games due to the ground's closure and if they beat Fermanagh in Sunday's preliminary round tie, a potential first round game against Donegal on 12 June will have to be played at a neutral venue. Adams said "it's about time we got it [Casement] reopened and got everything moving".